Last October I couldn't resist building an altar at the annual Spiral Dance ritual in San Francisco which generally draws a thousand people. I worked on the "For-Giving" altar and passed out the latest version of the Deception Dollar, as well as the new Perception Dollar. The altars are always works of art and some are very educational, built in memory of those who have died or are under attack, including endangered species. Someone had built an altar to the victims of the Gulf Oil Disaster, with photos of people who had made hairbooms to protect the fragile, threatened ecosystems. Later I got a little blue piece of paper with several websites on it, and decided it was time for me to look into the disaster which hurt my heart and mind to even think about. I tried to reach the woman, Summer Burkes, who had given me the flyer. I wanted to interview her on my radio show around Thanksgiving and organize a benefit for people in the Gulf before Christmas. Illness, death, travel, life seem to always interfere with any "planning" on my part. The Universe seems to have its own timetable and unfolds in mysterious ways. Summer finally phoned me in December, when I was recovering from being quite sick. (My interview with Summer Burkes is posted here. I will be interviewing Dr. Riki Ott on my radio show January 27th, Phoebe Sorgen on Feb. 3rd, and Lisa Gautier on Feb. 10th) Dr. Riki Ott went to Norway to speak at the Norwegian Social Forum and could conveniently do an event in the Bay Area in early February on her way from Hawaii back to the Gulf of Mexico. I was committed, inspired, couldn't resist getting together with Summer Burkes and a great patron of Bay Area activists, Allen Michaan, owner of the Grand Lake Theatre to pull together an event which we hoped would fill the theatre, draw attention to the plight of people in the Gulf, as well as the larger pattern of deception on the part of corporations, the government and the media, to galvanize a larger unstoppable movement to separate corporation and state. While this is not a 9/11 truth event, I do get to speak at it, and tell my story, and draw attention to the patterns that I see. One which I think 9/11 Truth activists should be aware of is those charged to investigate the Gulf Oil disaster. For those who don't remember January 2002, that was when Cheney asked Daschle to "limit" an inquiry into the "failure of the Intelligence Agencies" Senator Bob Graham and Congressman Porter Goss headed that inquiry, initially under the CIA's L. Britt Snider. Senator Bob Graham (who used to be CIA and recruited Porter Goss, who also worked for the CIA), also happened to breakfast with the ISI's General Mahmoud Ahmad, and they never bothered to investigate themselves for their own relationship with the man who was reported to have had $100,000 wired to Mohammed Atta. Graham was also appointed to co-chair the National Commission on the BP Deepwater Horizon Oil Spill whose 400 page report blamed the spill on a failed culture of safety at BP, Halliburton and Transocean, and a failure of government regulation. Does this bring back some memories? How long did it take for people to migrate from shock, confusion, incompetence, LIHOP to MIHOP? There are some very nasty facts, yet to be unearthed about the Gulf Oil disaster, but there is one thing that we do know- there is massive lying, and a cover-up going on, and those engaged in the clean-up and exposed to the toxic air and water are at risk. Here is an invitation to Oilpocalypse Now. I think we are tailoring our press and invites to different crowds of people- environmentalists, activists, young, old, scientists, artists and because the subject is so serious we are injecting some art, humor, and fun into this event, which might not appeal to everyone, but I couldn't say "no" to Summer who used to be very involved with Burning Man, and went to help with Burners Without Borders. (When we held the San Francisco International Inquiry into 9/11 in March 2004,; I organized the Behind Every Terrorist- There is a Bush music, comedy, art, poetry event to overcome some of the psychological resistance to our issue.) We don't want this even to be all gloom, doom, disaster; we want to inspire folks to get involved and do something creative, positive and healing. Doors open at 6pm, Welcome at 7 pm, followed by a tinfoil hat and costume contest judged by John Law, co-founder of the Cacophony Society and Laughing Squid ! (BYO tinfoil) before the serious speakers. The film begins at 8 pm, followed by a discussion pointing towards solutions, including - a 28th Constitutional Amendment for the Separation of Corporation and State & Questions and Answers. Where: The Grand Lake Theater, 3200 Grand Avenue, Oakland, California. Admission- $10 - $20. Riki Ott, PhD, is a community activist, a former commercial salmon "fisherm'am," and has a degree in marine toxicology with a specialty in oil pollution. She experienced firsthand the devastating effects of the Exxon Valdez oil spill—and chose to do something about it. She is the author of Sound Truth and Corporate Myth$: The Legacy of the Exxon Valdez Oil Spill and Not One Drop: Promises, Betrayal, and Courage in the Wake of the Exxon Valdez Oil Spill (Chelsea Green, 2008). She is also the founder of three nonprofit organizations that deal with lingering harm from man-made environmental disaster. 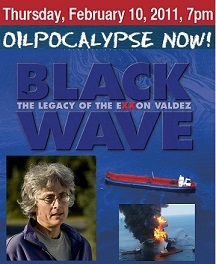 She is one of the main characters in the documentary, Black Wave. She lives in Cordova, Alaska, but has spent many months in the Gulf region and will be returning to the Gulf after this event. Summer Burkes is the gifted writer of The Ladies' Guide to the Apocalypse. She never considered herself an activist before Earth Day, 2010. She *still* thinks of herself as a fledgling New Orleans homeowner and Lower Ninth Ward community member who tried to help protect her new home and stanch the flow when the Powers That Be poked a hole in the Earth they still can't fix. Working closely with Matter of Trust and Burners Without Borders in the days after the Oilpocalypse began, she and her colleagues ran around in the Bayou, posting lookouts, trying to get to the bottom of cleaning up the oil themselves, hiding whenever the Coast Guard (or BP) came by in their boats, armed with assault weapons. Lisa Gautier - President of the ecological public charity Matter of Trust established in 1998 (the group uses waste clippings of hair, fur & fleece to soak up oil spills) This was the most prominent citizen-led task force in the wake of BP Horizon. Overnight, this small non-profit ballooned into the most likely method for Americans to do their part in helping protect the Coastline. Tens of thousands of concerned citizens collected hair from salons in 30 countries. It was stuffed into pantyhose by hundreds of volunteers at the Gulf where tons and tons of “hairboom” were made and ready. These booms are a shockingly effective waste-stream method of soaking up oil, and BP's boom department agreed. Then, to everyone's surprise BP’s $900-million PR department smeared and quashed the movement. Phoebe Sorgen was an eco and anti-nuclear activist who, since 9/11, began focusing on peace. She risked arrest at Lockheed Martin, Bechtel, Chevron, B of A, San Quentin etc, and served on the KPFA LSB. When chairing the BFUU Social Justice Committee, she learned that abolishing corporate personhood is key to most of what we want. Resolutions she wrote as a Berkeley Peace & Justice Commissioner would rein in corporate rule, from addressing stolen elections (Diebold voting machines) to challenging unfair trade agreements, Haiti's occupation and wars inc. She organized a Bankster Picket at the SF Federal Reserve and, with the Women's International League for Peace & Freedom, Citizens United protests. Black Wave- The Legacy of the Exxon Valdez documents the struggle of the people of Cordova, Alaska, two decades after a drunk captain veered off-course and 11 million gallons of crude poured into the ocean. The stunning landscape and heartbreaking tales, are moving and instructive. A similar, but larger tragedy is unfolding in the Gulf as BP uses a near-identical litany of lip service, lies, litigation and disregard for humans and environment in service to their bottom line. The superficial, inadequate, toxic clean-up of Prince William Sound and the lengthy legal battle Cordova endured, still falls laughably short of ‘making them whole’ as promised, exposes the deep biases and injustice of a broken system. Contrary to the rosy reports on tv, the people in the Gulf Coast are starving and mentally exhausted, and fresh oil is still coming in every day. Dr. Riki Ott, founded Ultimate Civics to build a popular movement and pass a constitutional amendment to reinstate the primacy of human rights over corporate rights. Their mission is to- inform people of the need to abolish corporate persons; encourage and assist citizen-driven efforts to pass ordinances; coalesce these efforts into passing state laws to trigger a national movement for a 28th AMENDMENT FOR THE SEPARATION OF CORPORATION AND STATE. Burners without Borders, Matter of Trust, Ultimate Civics will have tables in the main lobby; this is an organizing opportunity. In the face of rampant corporate power, supported by government lies, a corrupt judiciary, only organized, sustained people power can turn the tide. Join a diverse group of people for a unique informative, inspiring evening, bring your tinfoil hat, your issue, and your friends. You can also pitch in and help with outreach. (Call me or send me an email cbrouillet(at)igc.org 650-857-0927, if you can help with putting up posters and passing out cards/flyers.) This event is a labor of love, a volunteer effort, organized by Summer Burkes, The Ladies' Guide to the Apocalypse and Carol Brouillet, Community Currency and the generous contribution of time and effort from the speakers, as well as the generous contribution of the beautiful venue from the Grand Lake Theatre's owner, Allen Michaan (Allen is an activist, too. The marquee is famous for its powerful political statements. If you are an Oakland resident, please support his efforts to create and pass an Oakland Parking Enforcement Reform Initiative).